Here's a lively interview with composer Judy Dunaway. Dunaway is perhaps best-known for her music for her own instrument of virtuosity, the balloon, but her music is about much more than those air-filled elastic vessels. Why is it assumed that an accompaniment runs simultaneously with the thing it's accompanying? When an adult accompanies a child to an event or the zoo, say, or someone walks with a another person — or maybe a pet — on a walk through a park or shopping mall, the accompaniment can be side by side or one ahead of the other. (Indeed, in crowded spaces, single file may be the rule rather than side-by-side.) So why not more pieces in which the thing and its accompaniment are not simultaneous, but just proximate, in the same neighborhood, keeping an ear or eye out for the other? I could imagine a solo performed in the first half of a concert with its accompaniment bopping in late in the second half, for example... they're still attached, just on a longer leash. The composer Lloyd Rodgers has left us. Born in Long Beach, California (June 2, 1942 - December 28, 2016, in San Diego), living away from Southern California only for two years in his first college teaching gig in Michigan. He studied, bachelor's-master's-doctorate, at UCLA, where, as a grad student, he was a close informant of Roy Harris (Harris would have Rodgers listen to the latest LPs that came his way and report back on them so that Harris wouldn't have to listen himself), a co-conspirator with Douglas Leedy, then low-man and house radical on the composition faculty totem pole, but considered his primary composition instructor to have been Mario Castelnuovo-Tedesco. He recently retired after 42 years tenure at California State University, Fullerton, where he became something of a local legend, a corrective or counter-force to institutional music making, through his teaching and through his work with a series of alternative music-making ensembles, notable the CSUF New Music Ensemble, the Cartesian Reunion Memorial Orchestra (the most prominent Southern California new music ensemble of its day not to be included in Los Angeles's edition of New Music America), a CSUF-based Diverse Instruments Ensemble (or D.I.E.) that was a kind of combination Collegium Musicum and Scratch Orchestra for experiments with historical and new music in open or reimagined instrumentations (typical program: arrangements of Satie, Zarlino and Bach), but also an excellent way for adventurous musicians to get University ensemble credit without having to deal with the usual choir, band, or orchestra, and his own professional ensemble, the Lloyd Rodgers Group. Lloyd's compositional work began firmly in the avant-garde of the late 1960s, but with a commission from the Mirecourt Trio for a piano trio of classical dimensions, he made a decided turn to a modal or tonal world, in which cycles and repetitions were once again allowed, but without any sentimental attitude toward The Tradition. 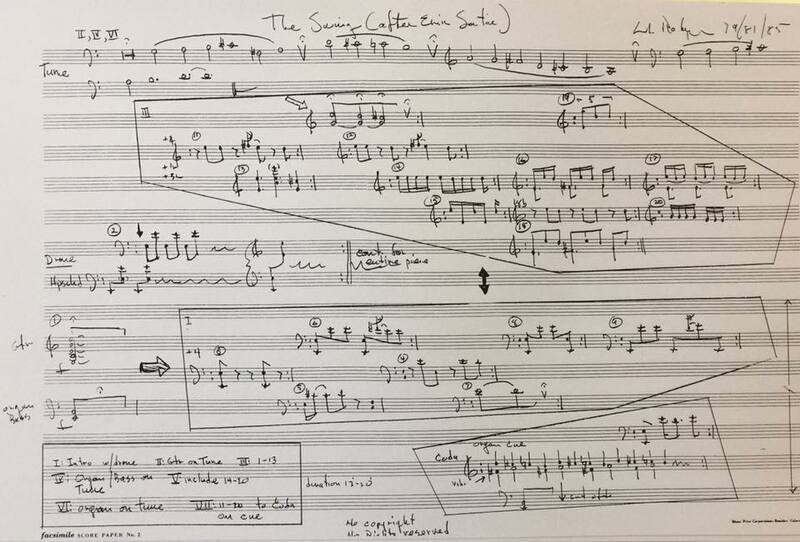 Many of the pieces were modular in construction and with an instrumentation to be determined in rehearsal (see the score of 1985's The Swing, above.) In co-founding the Cartesian Reunion Memorial Orchestra, he began to work with a democratic or collective environment pooling the members' compositional and instrumental resources. In principle, an "open" instrumentation group, its most stable grouping included Rodgers on sax, clarinet and keyboards, two or three additional keyboardists, vibraphone, guitar, cello, and electric bass, a mixture suggesting its unsettled relationship to both classical and pop groupings (though possibly more settled towards an early music mixed consort) but also directly connecting to the already-established East Coast ensembles of Reich and Glass and the experimental ensembles in England which Lloyd would later discover with great enthusiasm. (I first heard of the CRMO via an underground cassette with them playing a very odd arrangement of Liszt's Lugubrious Gondola v e r y s l o w l y.) In addition to his concert works, Lloyd had a long professional relationship with the choreographer Rudy Perez, and major works for dance included an Orpheus (1988) and The Little Prince (1987). A note on the passing of the Mexican/American (dual national) tuning theorist, Ervin M. Wilson on December 8th. Wilson, born in Colonia Pacheco, Chihuahua, Mexico was a non-academic theorist specializing in alternative tuning systems, their notation, and designs for keyboard instruments to accommodate them. Principle points of departure for his work were the generalized keyboards of Bosanquet, the theory of "evolving tonality" of the Polish-American musicologist and theorist Joseph Yasser, from which Wilson extrapolated wider varieties of new scalar types (his "scale tree"), typically identified by a total number of tones and a generating interval, and the arithmetic insights of the Mexican theorist Agusto Novaro. He collaborated with Harry Partch, Adrian Fokker, John H. Chalmers, Jr., and Lou Harrison. Wilson explored scales and tuning systems in just intonation, equal temperaments, and systems that do not easily fall into either category. He designed a large number of instruments, principally keyboards (the 19-tone generalized Hackleman-Wilson clavichord was a notable example) and mallet percussion and experimented with novel guitar frettings and collected a large number of indigenous flutes with equally-spaced fingers holes, thus approximating subharmonic series, along the lines described by Kathleen Schlesinger. Above and beyond the large number of practical solutions for instruments and notations typically presented in his virtuoso draughtsman's manuscript (he was employed, for many years, in the aerospace industry, as a draughtsman while also managing his ranch in Chihuahua where he carried out experiments in corn and chenepod hybrids) and the huge variety of techniques he developed for generating new scales and systems with musically useful potential (see especially the articles on the "Marwa Pemutations" and the "Purvi Modulations" as well as his later work with sequences of intervals associated with patterns in Pascal's Triangle, the "meta-meantone", "meta-slendro", "meta-pelog" and "metal-mavila", in particular,) I believe one of his most valuable contributions was the "combination-product set" which built upon his insight that the "tonality diamond" of Partch (with a precedent in Novaro, a diamond was basically a harmonic series multiplied by its subharmonic mirror) was, at base, a selection of tones based on globally organizing the factors of the (just) intervals between them. While the diamonds tended, inevitably, to reinforce a single tonal center, the Combination-Product Sets tended instead to be locally tonal while globally centerless, rich in symmetrical intervallic structures, but also rich in the total varieties of relationships found relative to each tone, and all in a compact system of just intonation of, typically, 6, 20 or 70 tones in total. To some degree, one could find in such a rich system a compelling alternative to many contemporary atonal practices in 12-equal. Wilson's idea of a scalar "moment of symmetry", in which a generating interval (a fifth, for example), within a given modulus (an octave, for example) at certain numbers of iterations creates a pattern of scale step symmetry in which the instances of the generator (and one closing, anomalous interval) each subtend the same number of scalar steps, appears to predate the notions of generated and well-formed scales familiar to many in the academic theoretical community. Wilson's principle publications were made over many years in the informal journal of experimental music, Xenharmonikon. 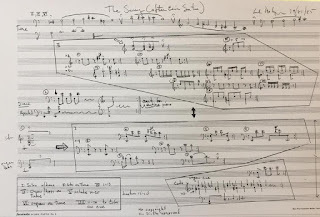 The composer Kraig Grady hosts a large archive of Wilson's manuscripts here: http://www.anaphoria.com/wilson.html A dissertation on Wilson's music-theoretical work by Terumi Narushima is now in press. And this, too: Erv was a generous teacher and a friend. He had an amazing ear (I was once tuning some metal tubes in his workshop and, from time to time from up in his room, he would shout out the ratios of intervals as they were tuned up "135/128! 13/12! 64/45!") and a greater imagination for new tuning systems, keyboards, and notations that all came in families that propagated and mutated like those corn or quinoa hybrids. He taught with generosity, mostly at his dining table, with excursions, when necessary, to the metallophones and bamboo marimbas and refretted guitars and the wheezing old Scalatron in his living room, and always began by asking if the student had anything to teach him first.